When your toilet isn’t performing to the required standards, it can have a significant impact on your home and family. And so when your toilet is spraying water and flooding the bathroom space, you need to react quickly and adeptly to the issue. 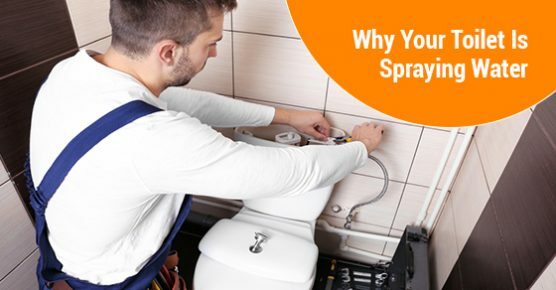 In this latest post, our plumbing services team explores why your toilet might be spraying water and the steps you can take in response. The water tank attached to the toilet could be overfull, as a result of a faulty float. This causes the tank to become too full of water, so when you flush, a large amount of water hits the water in the bowl, and then sprays upwards. The float component within the system isn’t particularly complex, but it can be challenging to replace if you don’t have professional plumbing experience. One of the more common reasons for a toilet spraying water from the bowl upwards is that the fill valve within the system is broken. During the filling stage, the water is supposed to flow down the standpipe to refill the bowl and the toilet trap. In some cases, the standpipe line is damaged or misaligned, and this can cause water to spray up against the underside of the lid and potentially leak from the bottom of the toilet. Call a professional to discuss the fill valve and standpipe replacement process. They can then review the system to determine the complexity of the repair work. The standard toilet is designed with six seals, the largest of which is the one between the tank and the bowl. A break within this seal will cause a major leak within your toilet and may lead to water shooting directly upwards from the bowl each time you flush. To resolve this issue, you must first drain and remove the tank. Turn the tank upside-down for better access to the seal. You can then effectively remove the old seal and replace it with a new one. In some cases, you might find that tightening the bolts on the tank is enough to stop the leak, but in most other scenarios, you’ll have to take on the seal replacement process, or call a plumbing services expert to handle the work. Our trusted team has decades of experience helping property owners respond to issues with their toilet systems. To learn more about our company and our work, contact us directly today!